I was born in Boston and have lived in Berkeley, California; Ithaca, New York, and London, England. I have a husband, Greg, and a son, Simon. Playing music with others is my biggest passion. I also like to ride my bike, swim, hike, practice yoga, read and cook. My favorite composer is JS Bach, but I love to play music of all styles, especially new music. I have been lucky enough to have several pieces written for me. I believe that you are never too old to learn something new. Jill Dreeben has performed in numerous solo and chamber music concerts throughout New England. She is a founding member of Solar Winds Woodwind Quintet, is a member of Kaleidoscope Chamber Ensemble and performs in the Dreeben/Clemente flute and guitar duo. She is a champion of new music, performing works by composers John Kusiak, John Armstrong, Ruth Lomon, Dana Maiben, Pasquale Tassone, Betsy Schramm, James Ricci and Jonathan Ragonese to name a few. She has played with the New England Orchestra of Lowell, MA and Emmanuel Music of Boston. Ms. Dreeben studied flute with Craig Goodman, Lois Schaefer and Louis Moyse. She earned a BA in Music from Cornell University and an MM in Flute Performance from New England Conservatory. Jill Dreeben is also a licensed Andover Educator teaching the course “What Every Musician Needs to Know About the Body”, as well as giving private Body Mapping lessons and workshops. 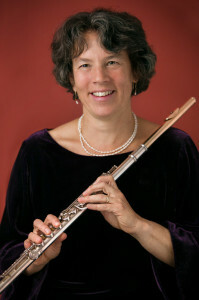 Currently she teaches flute at Brandeis University and maintains a private studio in Arlington, MA. Recordings include the new CD, Monhegan Suite and other Musical Journeys for Flute and Guitar with guitarist Peter Clemente as well as The Fool of the World and the Flying Ship by John Kusiak and Peter and the Wolf for woodwind quintet and narrator with Solar Winds Quintet.